What makes an egress window different than other normal windows? A basement egress window is designed to act dually as a fire or safety escape route in a basement where escape routes are severely limited to windows. These cutouts are required when you are converting a room in your basement into a bedroom. Since this requirement for basement egress windows in basement bedrooms is relatively new, old houses don’t have the required windows and need to be modified to make it legal. On a positive note, by adding an egress window in your basement you will be adding plenty of light to brighten the place up. Not all basement rooms need Egress windows, only bedroom-sized rooms with a closet require a window that meets Egress code. The average size requirement is an opening of 5.7 sq ft. The typical height expectation of your window is 44” off the floor. 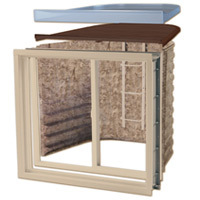 A window well is also a part of the necessary steps to a legal basement bedroom egress window (typically 48” x 48” with a depth of approximately 44” however this depends on how far underground the basement is). Adding bedroom to your basement and to your house overall, also adds to your home’s value. When selling, the added improvements of the extra bedroom with egress cutouts could cover your window installation costs at least 10 times.